Saints have their special national days in the United Kingdom. St. David is commemorated in Wales today, St. Patrick is popular in Ireland on March 17, St. George is honored in England on April 23 and St. Andrew is celebrated in Scotland on November 30 (search our blog for recipes associated with each saint). 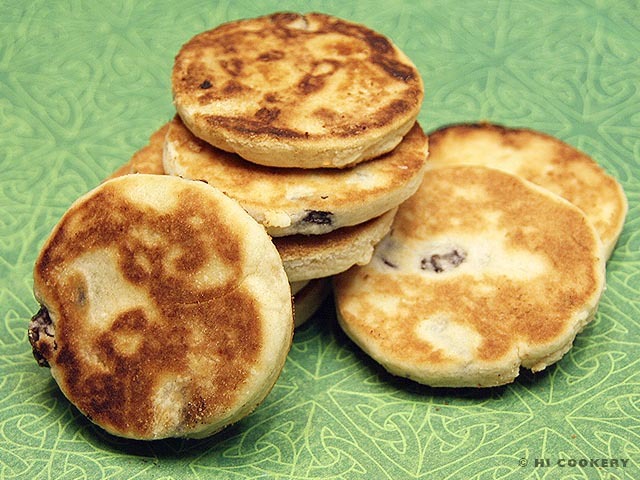 For the National Day of Wales, we made traditional Welsh cakes (or cookies) from a recipe shared by our Welsh friend, John L., and his wife, Lisa L. These tiny teatime treats, which we have eaten when attending Celtic heritage festivals in America, are cooked over a cast iron skillet or griddle and resemble petite pancakes. Feast on them on St. David’s day. Cheers! Iechyd da (yeh-chid dah)! In a large mixing bowl, blend the flour, baking powder, salt and allspice. 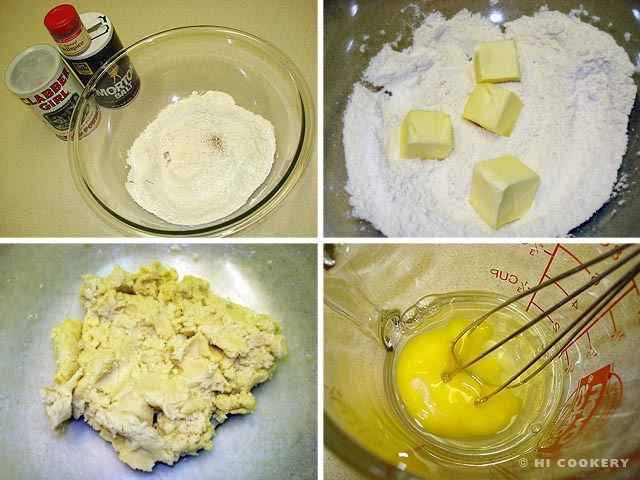 Cut in the butter and add to the flour mixture until crumbly. Lightly beat the egg and pour it into the crumbly mixture. 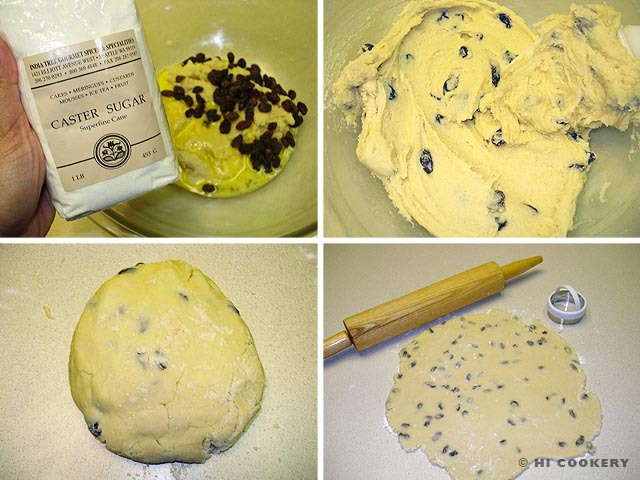 Mix in the sugar and raisins. Pour in a small amount of milk to make a dough. Sprinkle flour on a flat surface and roll out the dough to about a half-inch thick, turning the mixture as it is rolled out. 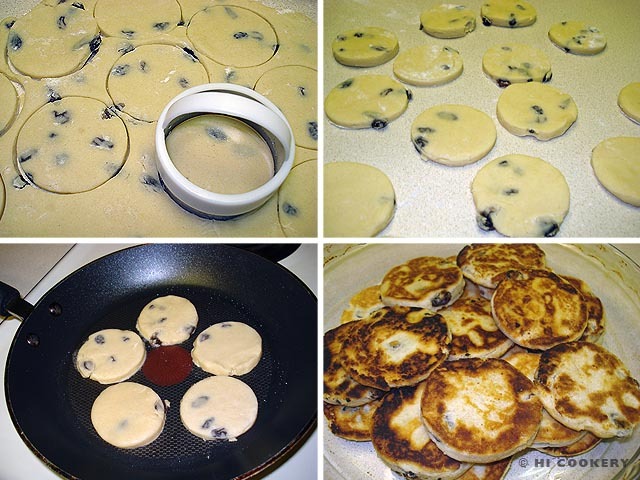 Use a round cookie cutter or rim of a glass to cut out the cakes from the dough. Re-roll and cut as necessary. Fry the cakes in a little oil about three minutes each side or until golden brown. Sprinkle with sugar to serve. Diolch (thanks in Welsh) to John and Lisa L. for the recipe. We tried to convert the measurements from the metric system and adapt the recipe for our American kitchen. Hi! Thanks for visiting my blog 🙂 These cakes look very similar to what I know as pikelets, which are very tasty and a great tea-time treat. I made Welsh Cakes for the first time recently and fell in love with them. I also made them using different dried fruits like cranberries and blueberries. Seeing yours has made me hungry!